A former Suffolk County police sergeant did steal $100 from a motorist, but he never targeted Hispanics during traffic stops as charged by prosecutors, the defense argued Tuesday on the first day of trial. “He violated every oath he ever took,” defense attorney Scott Gross said of the former cop, Scott Greene, 52, of Shirley, in his opening statement. 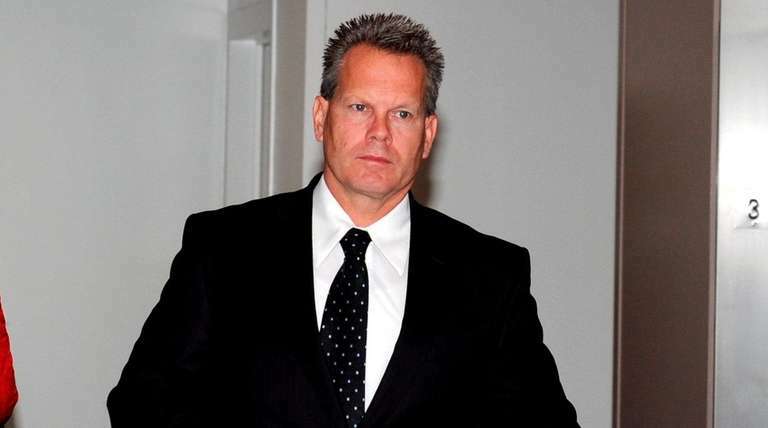 Gross told jurors in Suffolk County Court in Central Islip that he would not ask them to acquit Greene of a charge of stealing the cash from a motorist who was actually an undercover investigator working with a team of officers trying to snare Greene. The attorney tacitly conceded that Greene had committed misdemeanor larceny when he took the money during a Jan. 30, 2014, sting that was recorded by several cameras installed in a car that had an intentionally disabled taillight and a dangling rear license plate. But Gross said Greene never targeted Hispanics and isn’t guilty of several counts of larceny as a hate crime for stealing money from other motorists in a series of incidents dating back to 2010. Those charges are felonies and could land Greene in prison for up to 32 years if convicted. The misdemeanor carries a penalty of up to a year in jail. “What proof did you hear . . . that he targeted Hispanics?” Gross asked the jury after Assistant District Attorney Tisha Burrows made her opening statement. Burrows told the jury that six victims would testify that they were pulled over and had money stolen by Greene, who targeted Hispanics driving vehicles with out-of-state license plates. Gross noted that the Suffolk County Police Department had signed a consent decree with the U.S. Justice Department in the month before the sting to settle charges that it engaged in discriminatory policing in its dealings with Hispanics. After signing the agreement, “they decided to set Greene up,” Gross said. Greene retired in February 2014 after more than 24 years on the force. He rejected a plea deal of 2 1/3 to 7 years in prison and faces up to 11 years to 32 years if convicted. Judge Fernando Camacho, outside the presence of the jury, ordered prosecutors to find out whether the victims expected to testify were among the 21 Hispanics who have filed a federal lawsuit for damages against the police department, arguing they were targeted for traffic stops because of their ethnicity. A federal judge has allowed the lawsuit to proceed without releasing the identities of the men because, he said, they had a “reasonable” fear of police reprisals. However, Camacho said it was “basic fairness” that the jury should know whether a witness has a financial interest in the outcome of the trial. Testimony began Tuesday afternoon with police witnesses. Alleged victims could begin taking the witness stand Wednesday.